Best Professional Quality, Top Safety Rating – Heavy duty nylon webbing, heavy-duty carabiner. Relefree suspension strap is professional grade tested to withstand 1000+ Pounds of Tension. The set comes with a Premium door anchor and an extension attachment anchor (36 inches). Most Professional Design, Exercise Anywhere – Perfect for tree trunk and branches, doors, open beams. One Double-Loop Anchor Strap – perfect for bars and beams. One Door-Anchor – perfect for indoor door, fast to attach, no long strap hanging down. The compact drawstring bag can carry it wherever you go conveniently. Suitable for Everyone – Relefree suspension system provides you healthy workout in anytime and anywhere you want. From beginners to professional athletes develop more powerful pecs, triceps, biceps and leg muscles with a variety of exercises including pull ups, push ups, rows, flys, squats, lunges, etc. Most Compact, Easy to Use – Relefree suspension strap with the use of advanced industrial technology, weighs less than 2 pound. Its installation method is very simple, either at home or outdoors, as long as the belt is fixed to the door, wall or elsewhere, will be able to ready to start exercise. 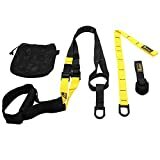 Best Home Gym Gift, Satisfaction Guaranteed – Each set includes: professional suspension exercise straps, use manual, door anchor and drawstring carry bag! Give you and your family a wonderful yet practical total home fitness program! Suspension Straps is now a popular form of strength training in not just health clubs and athletic training facilities, but also in home gyms from the newcomer to the alite athlete.Suspension straps develops strength, balance, flexibility and core stability simultaneously. The system is little set-up and space ensure you are always ready to train. Ideal exercise program for small spaces, travel, and busy schedules. WHAT IS RELEFREE SUSPENSION STRAPS INCLUDED?